Reading is the foundation of a life filled with learning and understanding of the world. What a gift it must be then, to instill love for reading in your child. If you are able to do so, you guarantee your child’s success and ensure their ability to learn, grow, and adapt to the ever-changing society in which we live. If the proper reading skills are not developed by your child, he or she will struggle with all of the subjects in school. Parenting is not an easy job, and it is especially hard when you see your child struggling to master something as complex as reading and phonics. As an adult with years of reading experience, it can be hard to visualize why your child is having problems picking up something that came so naturally to you and to others. This can leave you feeling inadequate and frustrated, both of which can have a negative impact on your efforts to improve your child’s reading skills. 1. Read with your child often no matter what his or her age. Bedtime stories are not just for babies and preschoolers. Schedule some sort of age-appropriate reading activity that the whole family can enjoy each and every day. Some ideas include reading the newspaper, sharing poetry, creating plays from story books, and having a family reading hour. Remember what families did before radio and television? They read together, and you can too. 2. Ask your son questions about what was read to see if he understands the text. Can your child relate the story to something or someone that he knows? 3. At different points in story books, ask your daughter to predict what is going to happen. Do not tell her what you think is going to happen. Be sure to ask questions at the end about the outcome and what she thought about it. 4. Educational toys and computer programs that reinforce reading skills can be a great idea. Be sure that these encourage your child to read, though, and that they do not become a chore. Your child will not stick with anything that is not enjoyable. Strive to keep reading an enjoyable part of your child’s education. 5. Instill a love of reading by setting a good example. Turn off the TV and pick up a book yourself. 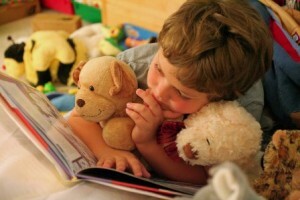 If you make reading a regular part of your life, your child will want to follow suit. Go to the library together, and make reading a leisure activity. 6. Look for opportunities to read where your child least expects it. This can be especially good for children who refuse to cooperate with tutoring or other efforts to improve their reading skills. Ask your child to help you follow a recipe for making their favorite cookies or have him read you the lyrics of his favorite song. Be creative; the goal is to get your child reading. Remember, creativity is the key to teaching your child to read, and then helping your child improve her reading skills. Don’t just bark commands at her or make her practice reading drills. Instill a love of reading in her and she will continue to learn and grow even when you are not watching. Dissertation Writing For Students Still A Challenge?